Modern railing systems are growing in popularity, but what are their common characteristics? Clean, industrial, and sleek, modern style is the minimalistic segment of interior design. When it comes to modern stair railing designs, less is truly more. Modern architecture recalls styles from the early to mid-20th century. This week, we explore some current trends in modern railing and stair design. How do Stairs Play a Role in Modern Design? Staircase design can set the overall scene for a space, and a modern railing is a perfect fit for a minimalistic home or commercial building. 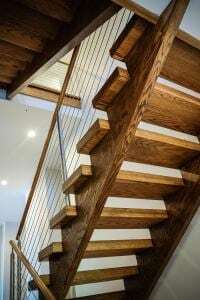 We often say that a well-designed staircase is like a beautiful piece of furniture. With clean lines, a modern stair railing presents a polished and sleek surface. 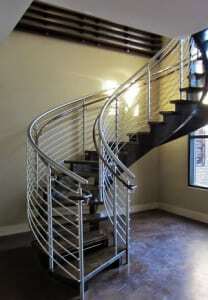 Many modern staircase railing designs incorporate industrial materials such as glass and steel. Simple color palettes, open spaces, and geometric elements are common modern design aspects as well. This week, we showcase four unique modern railings, designed for contemporary commercial and residential spaces. First, we highlight a modern stainless steel handrail system designed to complete a curved free-standing stair. The open riser construction allows for open, unobstructed views across the space, a tenet of modern design. Along with the risers, the stair railing design incorporates thin, parallel stainless steel bars which allow additional openness and add to the space’s modern appeal. Next, we move to another modern free-standing staircase system. Like the curved stair above, this straight stair utilizes open risers to create a striking modern feel. The 2-inch dark wood treads add an air of sophistication and offer a unique contrast against the light walls. The sleek glass railing, designed and constructed for ultimate safety and quality, further opens the space and sets this stair apart. Our next featured modern stair railing design is a cable rail accenting a straight stair. This unique staircase system includes a combination of open and closed risers, with the upper segment open and transitioning to closed risers below. The red oak treads and clean, parallel lines of the stainless steel cable railing offer a simple contemporary look. For those seeking a different type of modern metal railing system, the staircase below includes simple, vertical mega balusters in ¾-inch size. With a sleek T-rail style handrail, this straight stair stands apart through its 2-inch false nosing red oak treads and clean, white paint grade risers. 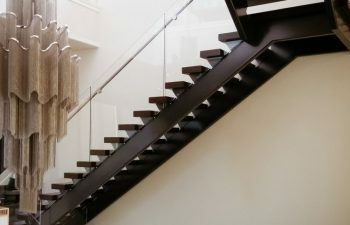 Our team works with builders, architects, designers, and homeowners across the nation to design and construct unique, high quality staircase systems. 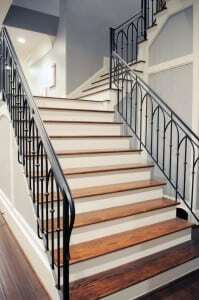 With extensive capabilities and talented craftsmen, we can bring your unique modern stair and railing design to life. 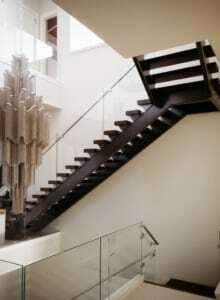 Visit our modern railing project gallery for additional details and pictures on our exquisite projects. From inspiration to installation our team is committed to designing and building the highest quality custom stairs. Our reputation speaks for itself, and client satisfaction is our highest priority. Contact us today to discuss your next wrought iron handrail project.